There are several ways to rotate a video that appears sideways or upside down when you view it. iMovie is free and is available from the App Store for both iPhones and Macs. There are others you can use on your iPhone if you aren’t a fan of iMovie; two we like are Rotate And Flip - RFV and Video Crop – Trim & Cut Videos (which also rotates videos). 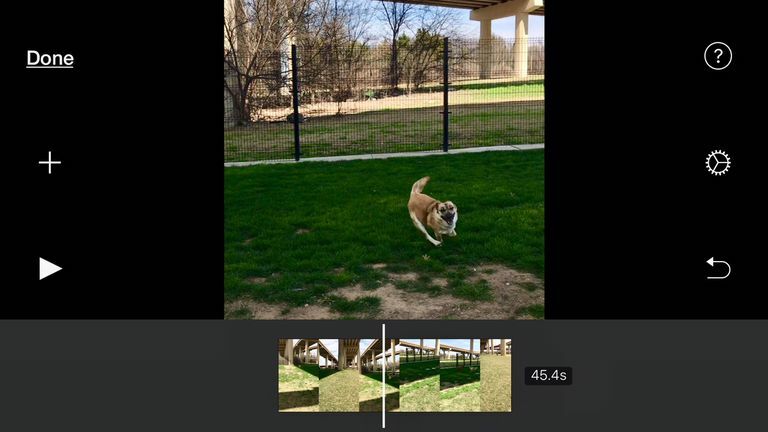 If you have a newer, updated, iPhone you can now take videos in Landscape mode without having to worry about the video appearing sideways when you view it. The need to rotate videos might fade as time passes. If your iPhone has iMovie on it, or, if you can install the app from the App Store, you can use iMovie to rotate a video. The most recent iMovie app requires iOS 9.3 or later though, so you won’t be able to install the app on older iPhones if it’s not on there already (see the next section if that’s the case). Click the + sign and click Movie. From the list that appears, click the video to rotate. Place two fingers on the video and make a rotating motion. This will rotate the clip clockwise or counterclockwise. Open the video to rotate in iMovie. In the browser or timeline, select the video to rotate. Click the Cropping button. It is the only square-shaped icon. Click either the Rotate Clockwise or Rotate Counterclockwise button as many times as desired. Note: To rotate a video on a PC, consider a free app like Movie Maker. The Rotate and Flip app is easy to use and lets you rotate a video on iPhone in a few simple steps. This app also lets you flip a video upside down, right to left, and left to right. Open the app and click the icon that looks like a movie camera. If you don’t see any videos, click Camera Roll. Click the video to rotate and then click Select. Click the 90-degree icon as many times as necessary to rotate the video to the desired position. (The other two let you flip the video). The and Video Crop – Trim & Cut Videos app lets you rotate videos, flip them, and perform other tasks like setting the video quality and file type settings. You can also add music, filters, and more. Open the app and click the video to rotate. Click either Rotate Right or Rotate Left. You can also click Flip Vertical or Flip Horizontal.